Inquiring minds want to know! What in the world was it that we gave dad for his birthday this year? Well. I have this big giant dog bed in my dad's man-cave at home so that I can be comfortable while I assist him all day with the very important stuff he does when he works at home, and it needed new bedding because they have had the same stuff on this bed since they got married ("13 years of true bliss!" according to dad) and things were starting to break around the edges so my super thoughtful dad was only thinking of me and my well being (oh, my aching back!) when he asked mom to buy new bedding for his my bed for his birthday this year. Let me tell you something .... mom went all out. I got new pillows, a big fluffy mattress cover (ahhhhhhhhhh) , new sheets, and a new comforter. I am so comfortable now I can hardly keep my eyes open while I am helping dad. Oh, and dad says he likes it too. Or at least that tiny corner part of it that I sometimes let him nap on too. Since it was your dad's birfday pressie, you really should give him his choice of 2 corners. But mostly the whole bed is yours of course, as it should be. But just a word of warning . . . sometimes those humans get greedy when given such a choice and they think they can hog up the bed. Make sure you avoid this by really stretching out and rolling around during the night. Nice, I can see that is fits you just fine. Now are you quite sure that bed is big enough Duncan? And soft enough? What thoughful pawrents. You look great. Glad you're letting your Dad share part of it with you. 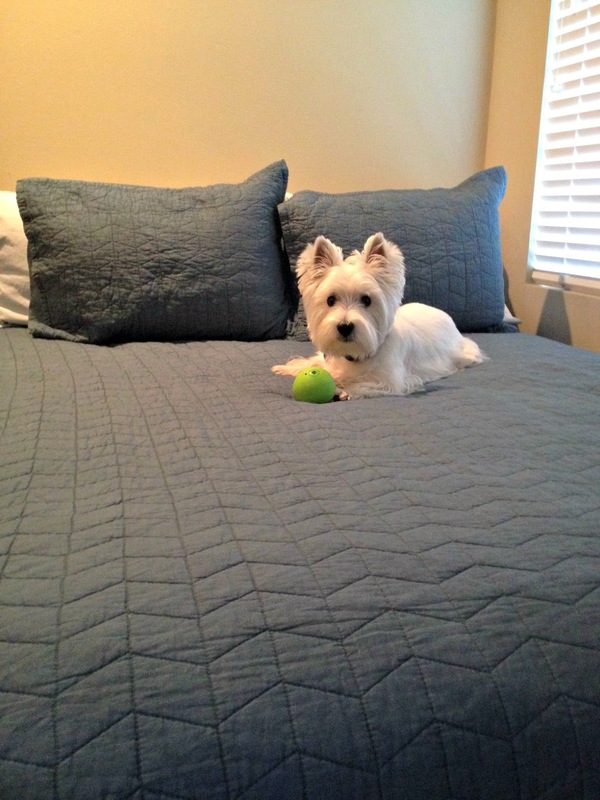 Buddy your Dad must be THRILLED that you have LOVINGLY Bestowed him with a portion of the new and improved bed. What a grrrand Birfday pressent that is... BRILLIANT actually. OMD! That is most FABulous Duncan!! And mighty Manly too! I thinks it's great that your Moms gots YOU a pressie on your Pops BDay!! That's the way it should be, ya know! NOws, don't let him gets any ideas...like it's HIS or something! Hold your ground!